So, Tulsa TechFest was held on November 6, 2009 in.. yep.. Tulsa. David Walker (@DavidWalker) did a fantastic job of bringing together over 500 people for 13 tracks of information… yes… THIRTEEN… only one SharePoint track though, I’ll have to get on to David about that. As expected I spent the entire day in the SharePoint track Talking with gurus Eric Shupps (@eshupps) and Corey Roth (@coreyroth). Eric presented two great sessions on “Integrating Customer Data in SharePoint with BCS, WCF and Silverlight” and “Customizing the Visual Studio 2010 SharePoint Deployment Process”. You can find more information about his presentations on his blog http://www.sharepointcowboy.com. Corey (http://www.dotnetmafia.com) stepped in at the last minute with his Enterprise Search presentation. All good stuff. Tulsa Techfest is where I was first introduced to the SharePoint Community last October. Wow, it’s been a busy year. So, I was more than happy to present this year. 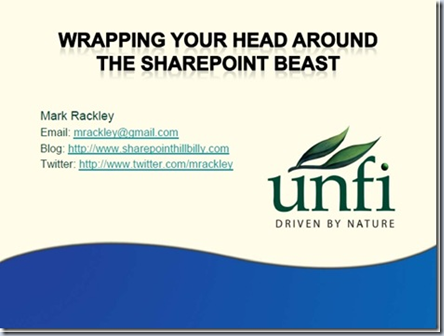 I presented my session on “Wrapping Your Heard Around the SharePoint Beast". This is my favorite session that I do and try to have a good time presenting it. If you learned something and were entertained, then I did something right. I developed this session as the developer/architect session I wish I had seen before I started SharePoint. My goal is to give attendees a good foundation to build on and maybe provide a couple of “ah-ha!” moments.